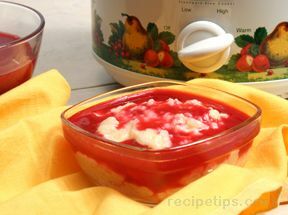 Fresh raspberries make the sauce a prefect topping for this sweet rice pudding. Rinse rice in cold water and drain well. Generously butter the inside of the crock from a 3 qt slow cooker. Butter the crock at least half way up the sides. 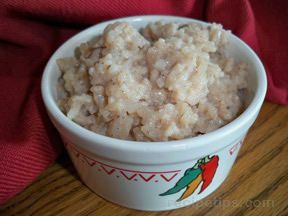 Add the drained rice, sugar, milk, and evaporated milk to the buttered crock and stir to mix. Cover the slow cooker and turn on high for 1 hour and then turn down to low and cook for 3 to 4 additional hours. Or, cook on low for 5 to 6 hours. The pudding should be stirred a couple of times during the last 2 hours of cooking. The pudding is done when the rice is tender and most of the milk has been absorbed. 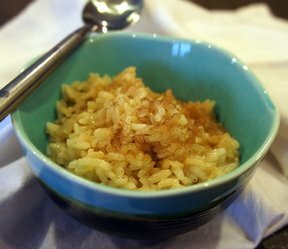 If the pudding becomes too thick before the rice is done, a little more warmed milk can be added. Prepare the raspberries by rinsing gently under cold water. Then spread them out on dry paper towels and pick out any damaged or blemished berries. Put the berries in a 2 quart slow cooker and add the water, sugar, and lemon juice. Cover and cook on high for 1 hour. After an hour, the raspberries should be very soft, if not, replace the cover and continue to cook longer. If berries are done, remove them from the slow cooker and mash with a fork until they are purÃƒÂ©ed. Then press the pureed berries through a strainer to create a smooth sauce. When done, taste the sauce for sweetness. If necessary, add a little more sugar to sweeten the sauce to desired taste. The sauce can then be refrigerated until you are ready to use. 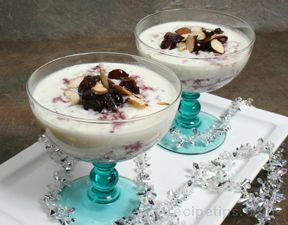 When the pudding is done, serve in individual bowls and top with the raspberry sauce.